I was dreading today. Bryan left at 7:00 this morning for a volleyball camp, followed by beach practice and then he came home around 8:00 only to walk down to the basement for a 'bible study. The guy has had a LONG day! His long day means my day was long as well...with the kids all by my lonesome. The kids were so good today!! After a brief bit of drama between the girls this morning we were cooking with gas all day. The biggest thing I was dreading was doing the grocery shopping with all 3 kids, but they were total rock stars through 2 grocery stores and the bank. They knew if they behaved they would get a reward which was making cookies and decorating them. 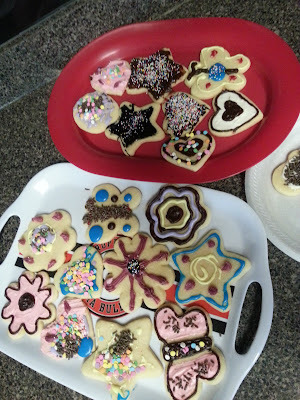 I even let the girls make the cookies from start to finish. If you know me, then you know this was a huge step because I'm one of those don't bother me while I'm in the kitchen people. I like to do my thing, clean as I go and serve up something yummy to eat. I think I got that from my paternal grandmother as she liked to do it all herself in the kitchen as well. After baking came the fun part...decorating! Nope...that is not lipstick. That is BLACK icing on his lips. He had that stuff everywhere! So decorating cookies is always exciting, but even more exciting is Jordyn lost her 3rd tooth!! She has been working on this tooth for weeks now. Honestly I think she has really helped it along because she is feeling a little left out of the loosing tooth game because she has only lost 2. We were about to walk out the door to tumbling when she showed me a very loose tooth. I knew that she wouldn't make it through tumbling without either putting her hands in her mouth (gross!) or loosing the tooth during class so we opted to pull it then and there. I wanted to post the video of it, but I can't get the video from Instagram to coordinate with my media player SO if you want to see the video you can find me on Instagram under jenlyn75. Or try clicking HERE to see the video. I think the link will work! Ug. This already makes her look older! !